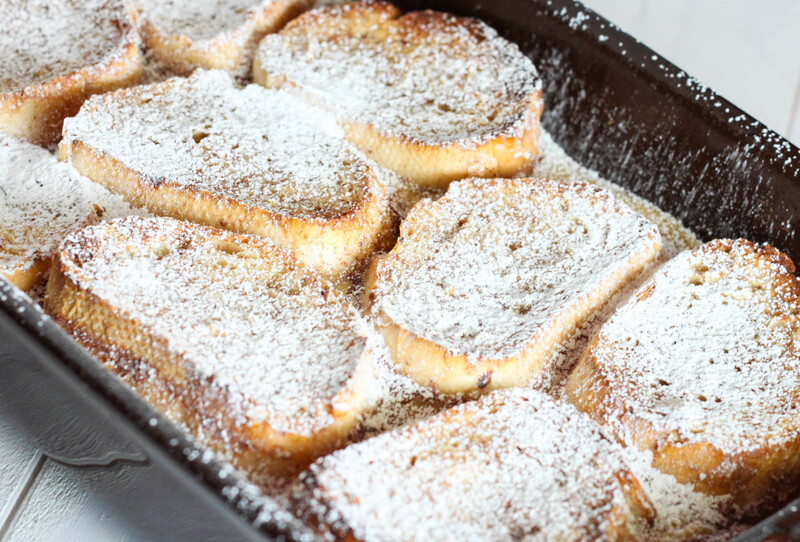 I have been looking and testing overnight french toast recipes for as long as I can remember, some were just okay and a couple went straight to the trash. I finally have found a keeper in this recipe from the Gooseberry Patch Hometown Christmas Cookbook. 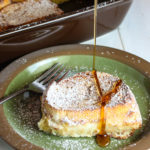 This recipe is very similar to how I make regular stove top french toast, with vanilla and cinnamon. The top of the toast has a crunch and the bottom turns in to a yummy vanilla custard. Just the way I like it! To make this recipe you will want to get one of the fat French bread loaves not the long skinny ones. You will want to get about 8 slices out of the loaf. Whisk together the remaining ingredients and pour evenly over bread slices and refrigerate overnight. The next morning bake at 400 degrees for about 45 minutes. 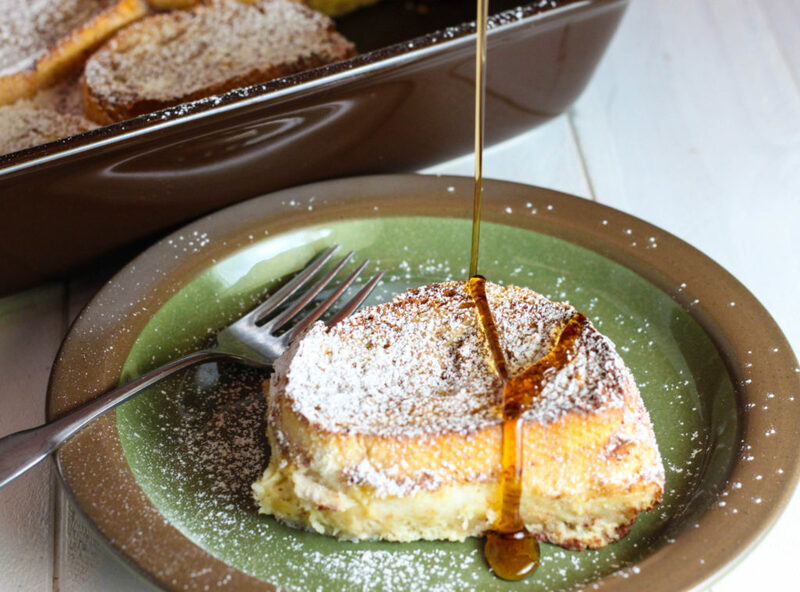 Top with a dusting of powdered sugar and maple syrup. A custard style French toast recipe that will quickly become a family tradition. This recipe is adapted from the Hometown Christmas Gooseberry Patch Cookbook. Spray a 9x13 inch glass baking pan with non-stick vegetable spray. 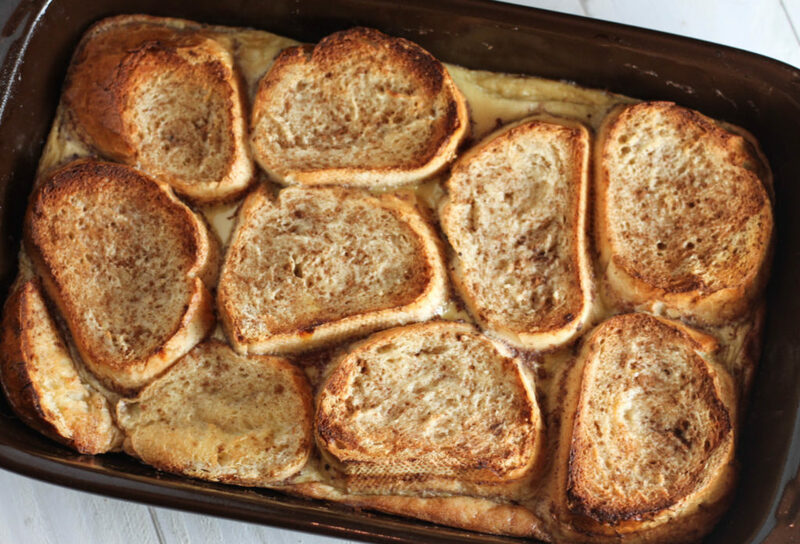 Arrange bread slices in pan in a single layer; set aside. 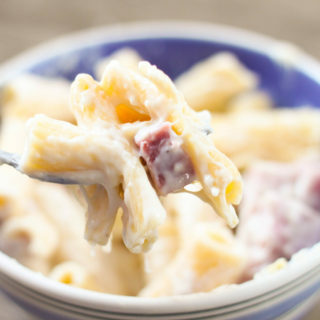 In a bowl, whisk together remaining ingredients except garnish until completely smooth. Pour evenly over bread slices until covered. Cover and chill overnight, or until most liquid is absorbed. Bake, uncovered, on center rack of oven at 400 degrees for 40 - 45 minutes, until puffy and golden. I made this recipe for a work event and it was a hit! I did find that it was better after it cooled down a little because it made it firmer, more of a custard consistency. Soooo delicious. Great recipe! 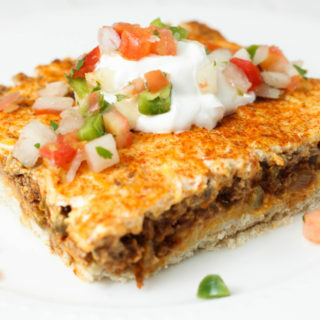 I was told this recipe from a Daytona Beach restaurant server in 1992 in which I loved! The only difference is I use stale bread before pouring mixture over slices.